I spent some time pondering how best to quilt this quilt and in the end decided that I didn't need to add any more detail to the already busy design. Instead of top stitching I have ditch-stitched almost every single seam line. That involved much quilt wrangling; turning the quilt often, sometimes stitching only a few inches and then turning the quilt again. Stitch and turn. Both the Flying Geese Units and the Dog Tooth border tested my patience but I am really pleased with the look and drape of the finished quilt. All up the quilting alone took approximately 6 hours of stitching to complete. For the back of the quilt I have used a single fabric - a small black dot on a white background - and have matched it with a black and white stripe binding. The binding fabric frames the quilt, draws the eye in and complements the medium scale black/white text border. I have not kept note of how many different fabrics that I have used for this quilt, but I guess it will be close to 200 different prints, including both neutral background fabrics as well as the colored fabrics. 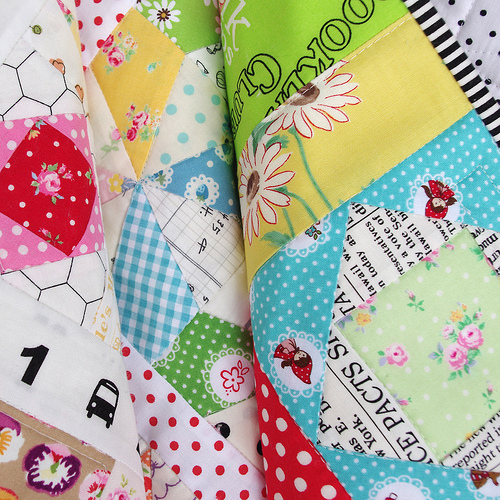 An extensive fabric stash is a wonderful resource and I love working from stash. It has taken a number of years (and a lot of hard work) to have on hand such a great collection of fabrics and I intend on using every last scrap. Eventually. and you can find this quilt listed here: Kaleidoscope Medallion Quilt. 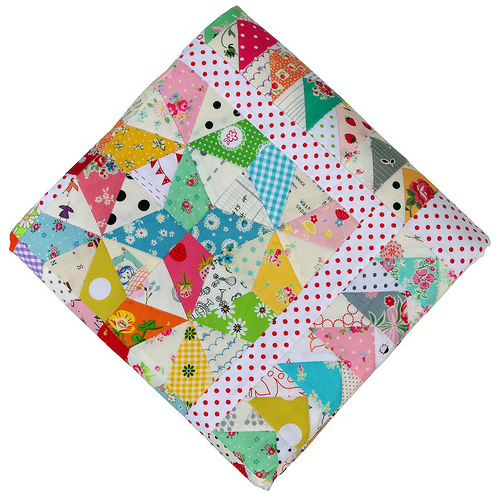 Dotty Border 1 - 1.5 inches wide including seam allowances. 48 Flying Geese Units each measuring 3.5 inches x 2 inches including seam allowances. 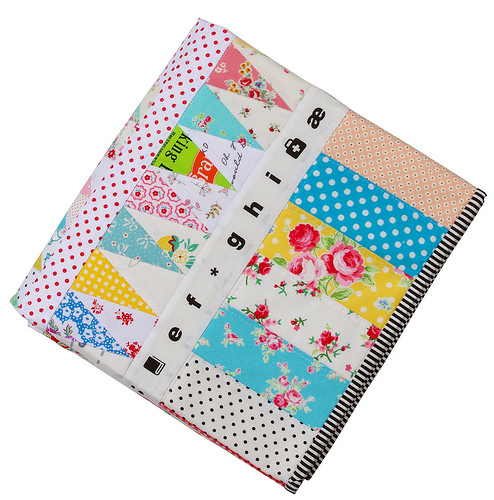 Dotty Border 2 - 1.75 inches wide including seam allowances. Dog Tooth Border - 3.5 inches wide including seam allowances. I drew up my own foundation papers using EQ7 for this border. Four 3.5 inch square Economy Blocks also paper pieced. Text Border - First of Infinity by Kumiko Fujita - 2 inches wide including seam allowances. Outer Border - 72 Rectangles measuring 2.5 inches x 5.5 inches. 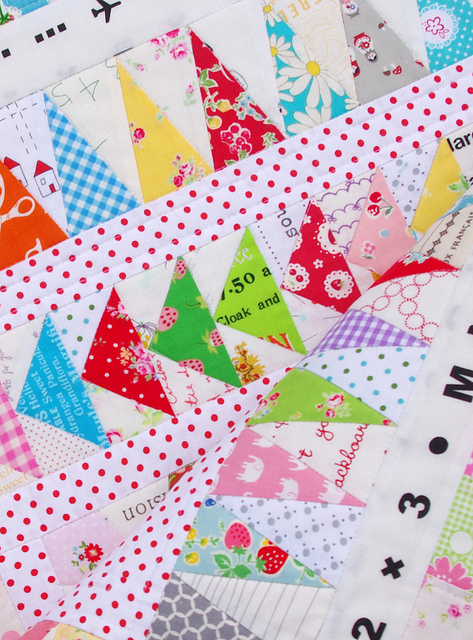 Four 5.5 inch square Economy Blocks also paper pieced. All text and images are copyright protected. Please do not use any content or images without permission. What a great quilt Rita. I love each and every photograph! Ooooo..........ooooh it so beautiful!!! I just love it!! I have been reduced to tears I am so moved by the beauty of this quilt. You should feel so very proud. Amazing Amazing!! Your quilt is beautiful! I fall in love with the fabric in your last border the one with letters and symbols. Can you please tell me what it is? Thanks! 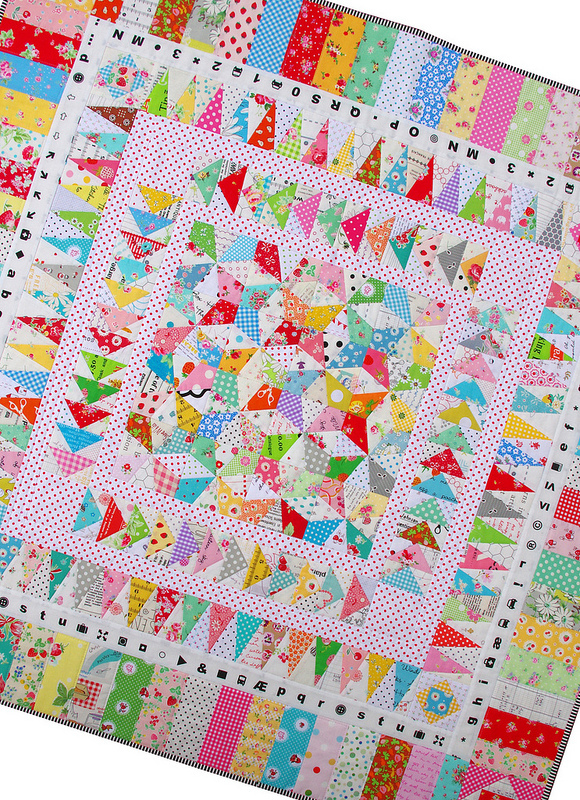 I'm certainly not getting tired of reading about this quilt. The more pictures the better, I say. Simply gorgeous. Fabulous. I can only dream of creating something so wonderful and using a Kaliedoscope block or flying geese for that matter. I am still a basic square! And all the time and patience you have put in to quilt. Thank you for sharing we us - I don't mind the heavy pics either! Wonderful, love the soft look of it! Absolutely gorgeous! I just love it and I'm not tired of see this beauty! Thanks for sharing this colorful piece of art! The finished quilt is lovely! I NEVER get tired of your picture posts - keep 'em coming, I say! Another inspiring masterpiece by the Master -- fantastic work in every way! I can't believe you are parting with this. I would definitely buy a pattern. Wonderful. And I love that you made your own medallion quilt - so inspiring to see others following their own path. What a great use of that black/white letter and airplane fabric. I really love how this one turned out! Such a feat. this is a classic tale of an artist: you started with a center of focus, the kaleidoscope paper pieced center. And for some that would have been enough. But you continued to add layer upon layer of yumminess, defining your spaces, visually sending the eye to the next layer. The piano key border is like a darling fence to hold your treasure. But the artist says... now the frame in your striped blk & wht binding. Voila! Fini! Lovely. Rita, you surprise us every day! I love this quilt. Best this year I think. If I give this a try I think I will leave out the red dots in the border areas to let the beautiful design breath a bit and create some negative space. Your quilt is amazing as usual! I can't imagine the aching you much feel after quilting a quilt in that fashion! You need a longarm! It's wonderful. Whoever snatched it up has a real heirloom. Rita, I'm back again to ask if you know where that First of Infinity text fabric might be available in that colorway. Pink Castle is out, unfortunately :( I have it in other colorways but not that one. Thanks! I have no problem at all you showing this quilt again. It is really nice to see, love all those fabric combinations. What a stunningly beautiful quilt - once again! And since I tried out your free kaleidoskop pattern, I know even more, what a tedious piece of work it was! 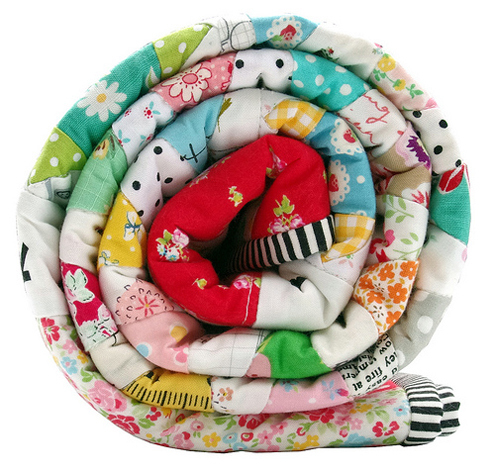 I am always too late to pick up one of your quilts in your Etsy store, since they are always bought up straight after having been listed :-) For how much did you sell this super cute one? This is amazing! 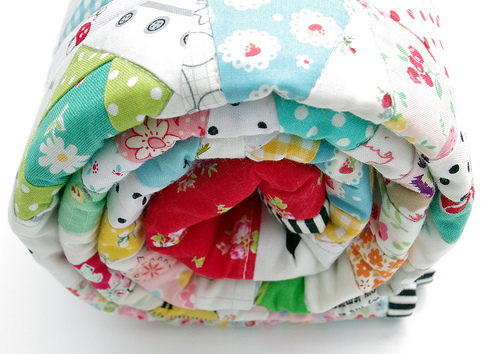 I love your fabrics and am envious of your stash - good luck using it all! It will certainly be enjoyable trying! It is absolutely joyful! And congratulations on all the fabric scraps that you managed to use. Absolutely stunning in every way! I'm drooling! 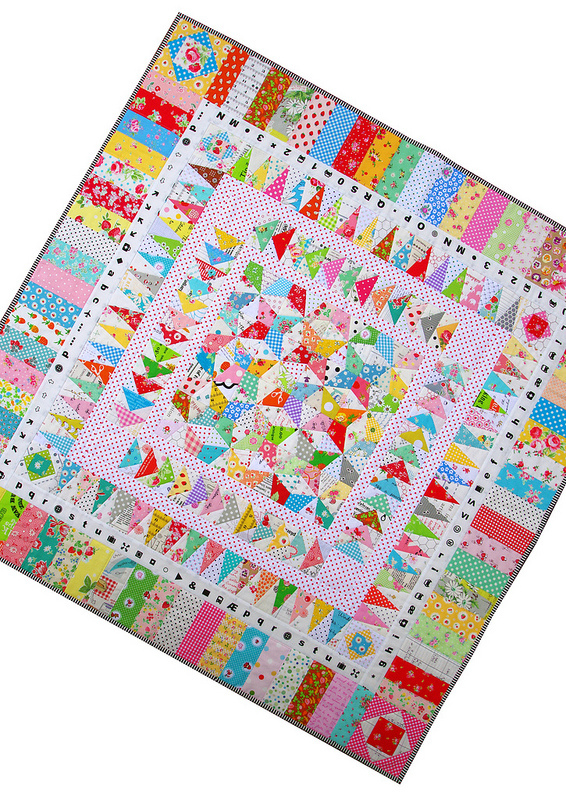 You can never show too many pictures of a quilt that is fabulous and I love the pictures that you share that is why I love to read your blog. Stunning quilt, great job! Wow. Just. Wow! Congratulations on another fabulous project completed and your attention to detail truly inspires me. Thank you! I love this piece! Your work and color choices are beautiful...in all of the shots! 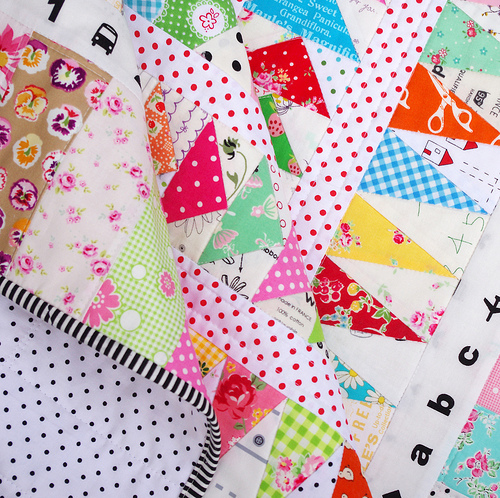 Wonderful quilt and beautiful fabrics! I love the photos of everything you do. The more the merrier, I say! Oh my goodness that is super cute, I must make one! That's a pretty darn awesome quilt!